The judges noted ASL Airlines Ireland ‘clever diversification from core freight operations while continuing to have success in that sector also’. The European Regional Airline Association (ERA) is the representative body for 54 European airlines and over 120 aviation service providers, including aircraft and engine manufacturers, airports and suppliers. Through its shared knowledge and experience ERA is able to offer its members an invaluable means of helping identify and address common challenges. This is the second major award this year for ASL Airlines Ireland. In May the airline won ‘Irish Aircraft Operator of the Year’ at the Irish Aviation Authority Awards in Dublin. “This award is the culmination of a great year for ASL Airlines Ireland when we successfully expanded and diversified our operations while maintaining our superior standards of reliability and quality,” said Colin Grant, Chief Executive of ASL Airlines. “Coupled with a rebrand, in common with our other three European airlines to ‘ASL Airlines’, and our charter holiday flights from Dublin, Shannon and Cork, it has been an extremely busy year for the team,” he continued. “Everyone at ASL Airlines Ireland responded to major challenges with skill, enthusiasm and professionalism and I’m delighted that their outstanding efforts have been rewarded with this ERA Gold Award that recognises the tremendous development of ASL Airlines Ireland as a European regional airline”, Mr. Grant concluded. Mr. McNamara continued “while the airline’s core freight operations continue to enjoy success, the judging panel commended its diversification into the ACMI market which, said the panel, represents a clever and shrewd move”. This is the 21st time since 1991 that the ERA Airline of the Year Awards have been presented, and the first time a Gold Award has been won by an Irish airline. Previously Irish airlines have won Silver and Bronze awards. The award was presented to ASL Airlines Ireland by Patrick de Castelbajac, Chief Executive of Aircraft Manufacturer ATR, who sponsored the awards. 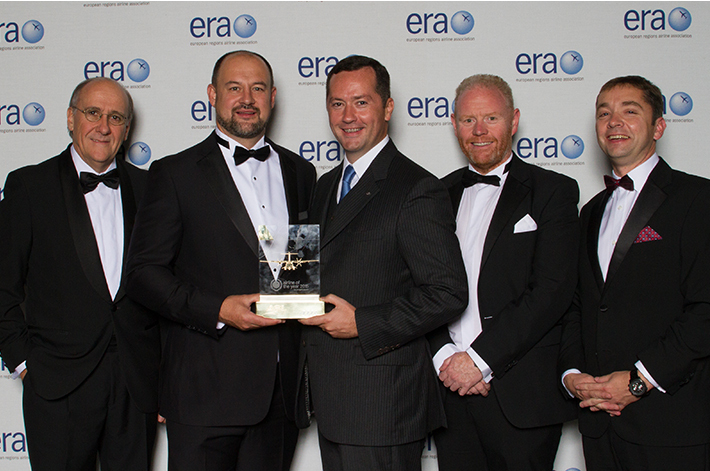 The ERA Airline of the Year Award is highly regarded for independent and thorough judging, with judging panels chosen for their knowledge and their ability to assess achievements against the specific circumstances and constraints under which individual airlines operate. This year the judging panel comprised senior industry experts including past CEOs of European airlines and independent aviation journalists from a variety of European countries. ASL Airlines Ireland is headquartered in Swords, County Dublin and is part of the global ASL Aviation Group. Formerly known as Air Contractors until its rebrand this year, ASL Airlines Ireland operates cargo flights for express integrator clients including FedEx and DHL. The airline also operates B737 passenger flights from Ireland under its own brand and B757 transatlantic flights from Dublin and Shannon to the United States and Canada for Aer Lingus. ASL Airlines now comprises four airlines; ASL Airlines France, (formerly Europe Airpost), ASL Airlines Switzerland, (formerly Farnair Switzerland) and ASL Airlines Hungary, (formerly Farnair Hungary). The four airlines operate a fleet of 80 aircraft in Europe, the Middle East and Africa including cargo operations for all of the major express integrators and both own brand and ACMI scheduled and charter passenger flights.